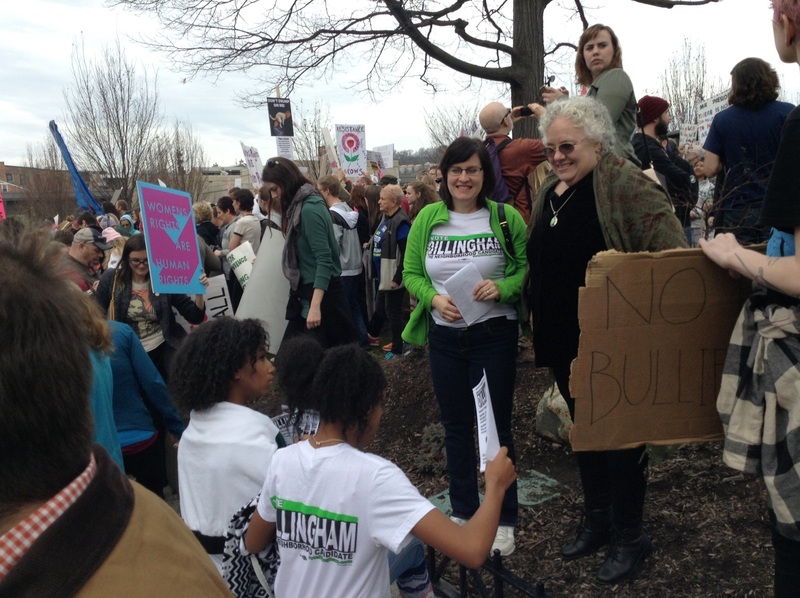 Michelle Dillingham and Noreen Loftus-Spilman at the Women’s March in Cincinnati. We spend a lot of time talking about what we want our elected representatives to do for us. In order for our representatives to have a shot at doing anything, however, they first have to get elected. This doesn’t just happen. It either takes a lot of money or it takes a lot of supporters or most often, some combination of both. It takes a community to get people elected. In Cincinnati, no one better represents this idea to me than Michelle Dillingham, our neighborhood candidate for city council. Michelle graciously agreed to talk about her community and what it means to her. 1. I love your slogan: “The neighborhood candidate.” Where did this come from? Cincinnati is a city made up of 52 neighborhoods, each one with its own flavor, its own uniqueness. Cincinnati elects nine people to serve the whole city, at-large. Elections typically have between 25 to 30 people running for nine seats. I’m the only candidate to have served on my neighborhood’s community council for 10 years in various roles, from secretary to president. For the past two years I’ve served on my neighborhood public school’s Decision-Making Committee as a Community Representative. Flyer for Michelle Dillingham for Cincinnati city council. 2. How did you get involved in politics? My earliest memory of activism was with my mother. She would bring my sisters and I with her to volunteer at the “Clamshell Alliance” in a small trailer nearby the Seabrook Power Plant. The Alliance was formidable—they protested the proliferation of nuclear power plants in New England in the late 1970s by staging large non-violent protests and other forms of social action. In graduate school I had the opportunity to intern and later work at City Hall for the remarkable Vice Mayor David Crowley. Crowley was not only a politician, but a life-long social worker. Learning from him and serving in his office for four years cemented for me that we need diverse representation and that social workers have an important place in the halls of power. 3. I believe no one gets elected without a community of supporters, especially if you’re trying to do it without big donors. Tell us about your community. 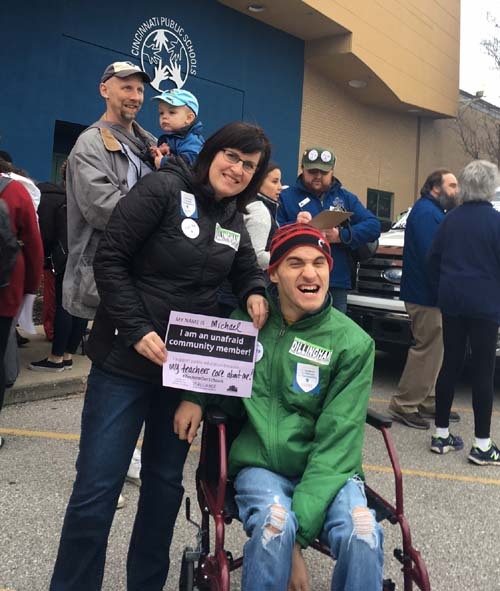 Michelle and son Michael at a Cincinnati Educational Justice Rally. There is money power, and there is people power. I am so grateful, and humbled, to be able to say I have people power. My support comes from many places—connections I’ve cultivated from my professional life as a social worker. My professional association the NASW-OH (National Association of Social Workers -Ohio) was my first major endorsement. My community of families with loved ones who have special needs is another. 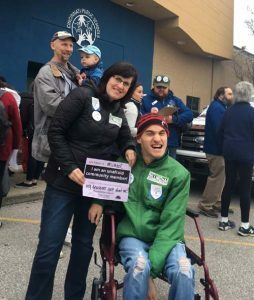 Our son Michael is 20 years old now, but back when he turned two years old is when I started participating in disability activism. I joined a local ARC team and we worked on Medicaid expansion advocacy. I later served for six years as a commissioner for a statewide agency that served adults with disabilities. Every cause I worked on, from food access to environmental justice, from affordable housing to public education, I’ve stood in my own struggle, and I’ve stood with people in their struggle. It is the power of the people from these communities that helps me. I do not expect to receive any substantial support from the corporate community based on what I have stood up for in the past. All the more reason running a highly targeted grassroots campaign is so important for any successful local, progressive candidate. Fortunately for us, it’s votes that are counted on Election Day, not campaign contributions. 4. What’s the importance of your community to you? Why do you need a community? Community is everything. It is more important than ever with the amount of money in politics today. I recently had a conversation with one veteran councilman who served for several years at Cincinnati City Hall. He reminisced how not so long ago a person could run for office and only spend $2,000. In this election we already have candidates who’ve raised over $100,000, and it’s only May. The only way for legitimate candidates to find electoral success who do not come from backgrounds of wealth is to organize. When you ask people why they contribute to political campaigns, over 60 percent of the reason is because they know the candidate or campaign in some way. This means the people making those small donations where they can, hosting house parties, volunteering on the phones, knocking doors, and working the polls are our foundation. 5. What role does money play with you and other candidates? As candidates, we must get our message out. Most methods we use to do that, like sending mail and knocking on doors, cost money. In a city as large as Cincinnati to reach say 30,000 voters, the cost can climb quickly. Many people will cast their vote for names on the ballot that are familiar to them. So direct voter contact to develop that familiarity is essential to winning, especially in a large field race. I was outspent 6 to 1 when I ran for City Council in 2013. Yet I only fell a few percentage points behind my opponents. So money isn’t everything. Another part of the money story in campaigns is it can show what constituencies are supporting a candidate, or the strength of community connections for a candidate. I have over 200 people who’ve made donations to my campaign. They are “small” donations for the most past (under $100) and certainly don’t compare to the large haul some of my opponents have raised. But they are getting support from the corporate community, who tend to write large checks. More progressive candidates like myself who are on record opposing rollbacks in the earned income tax, or tax incentives for the rich at the expense of the poor, are probably not going to see those big checks. My supporters are social workers, teachers, retail workers, restaurant workers, taxi drivers, artists, etc. We are trying to get out the message that everyday, working class people who support progressive candidates make a difference! There are more in the 99 percent than there are in the 1 percent. We just need to get them activated. 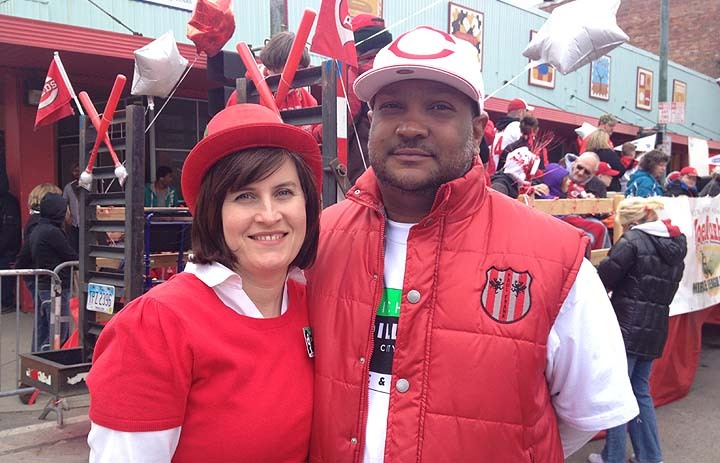 Michelle and husband Chris at the Cincinnati Reds Opening Day Parade. 6. How does running affect your family? For our family it’s been a significant sacrifice. When I’m out almost every night of the week, and weekends, at community meetings, gun violence vigils, budget hearings, and doing call time … that means I am not available to them. As a mother of a son with special needs, I have to practice the fine art of negotiation and compromise to make it all happen. But really I am very lucky I have a life partner, my husband Chris who supports me running for City Council. I hope I’m planting the seeds of political activism in them. 7. If you could ask one thing of folks, what would it be? I would ask that each of you make a commitment to support a local candidate running for office that you feel represents your values. Everyday people who are running for public office need your support. I want to bring progressive values to Cincinnati City Hall. I believe every one of us deserves a shot, that we should all pay our fair share and that we should all play by the same rules. I can’t do it without your support, the support of everyday people like you. Oh, and if you live in Cincinnati, #VoteDillingham! Michelle Dillingham is running for Cincinnati City Council so she can bring her community building and advocacy expertise to City Hall. 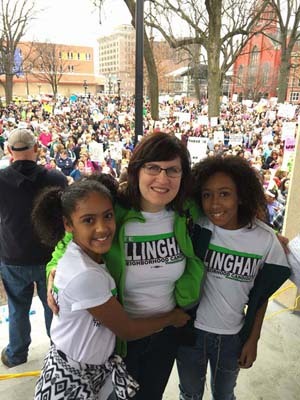 If you’d like to learn more about Michelle, visit votedillingham.com.